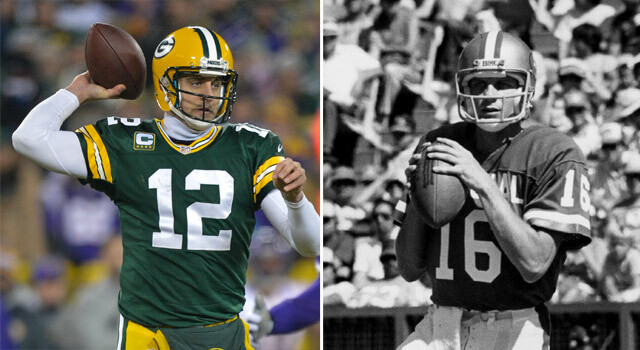 Who is the best QB from the 49ers-Packers rivalry? Published: Jan. 8, 2013 at 02:05 p.m. Updated: Jan. 8, 2013 at 02:38 p.m. When you think of the Green Bay Packers and San Francisco 49ers, one of the first things to enter your mind is the Bill Walsh coaching tree. The second is probably, "Why did the 49ers passed up on Aaron Rodgers?" Take a look at the best photos from the 49ers- Packers matchups through the years. The question is who is the best of the best? And I'm here to answer that right now. And despite the insistence of Handsome Hank of the Dave Dameshek Football Program (available on iTunes), Don Majkowski just missed the cut. As did Jeff Garcia, Lynn Dickey and Y.A. Tittle. Many of you have likely never heard of Herber, but ignorance is no reason to keep him off the list. Herber was the star quarterback of the Packers in the 1930s, and led the team to four titles during the decade as he teamed with Don Hutson -- who some consider the greatest receiver of all-time. Favre became the Packers' starter in 1992 and had one of the most prolific careers in NFL history in terms of yards, touchdowns and interceptions. And it's Favre's knack for the potential game-crippling INT that pushes him down this list. Young had the unenviable task to replace the legend in San Francisco, and he performed reasonably well with a couple of MVP awards and a win in Super Bowl XXIX. But reasonably well gets you about fourth on this list of Hall of Famers (or soon to be). When you put Starr's numbers up against today's quarterbacks, they look paltry by comparison. But when you consider the rules of the game in the 1960s and stack him up against his contemporaries, Starr stands out. Two Super Bowl MVP awards are no joke, nor are five NFL titles. Rodgers will be the undisputed best quarterback in Packers history (and beyond) with another Super Bowl win under his belt (pun intended with a discount double check). But to me, he still takes the top spot for the Packers, because in this era of the NFL there are none better. Simply the best quarterback to ever play the game (sorry Johnny Unitas fans). The winner of four Super Bowls (understand Starr has more titles), nobody was better in the big games. Rodgers would need at least two more Super Bowl wins to even think to supplant him. "Bold predictions for the NFL offseason..."